If you often travel abroad, or if you’re planning a big trip to a foreign country, you’ll need a no foreign transaction fee credit card. Don’t worry; there are a lot of options, including some of the best rewards cards available. If your credit card charges a foreign transaction fee, a percentage of every international purchase you make will be added to your bill. For most cards the fee is around three percent. That might not sound like much, but it can add up fast, particularly if you’re relying on that card for most of your travel expenses. For example, a $35 cab ride from the airport will typically incur a foreign transaction fee of about a dollar. Not too bad, but you’re likely to be spending hundreds of dollars or more while on your trip. If you spend $500 on meals and local transportation, you’ll be billed an extra $15 just for having the wrong card. And if you put your hotel and car rental on that card too, you’re suddenly paying a serious chunk of change to a credit card company for no reason. Spend just $1,667 and you’ll be forking over an extra $50 just for the privilege of using your card in a foreign country. There’s no reason to do that. There a bunch of great travel rewards cards out there that don’t charge foreign transaction fees. Generally speaking, the best rewards cards are those that allow you to transfer your points to a variety of frequent flyer programs. That’s because they offer a great combination of flexibility and value. You aren’t tied to one carrier, like you would be with a co-branded airline card, but you can still get the most value for your points by redeeming them directly through frequent flyer programs. The three big credit card rewards programs that let you do that are American Express Membership Rewards, Chase Ultimate Rewards and Citi ThankYou Rewards. These programs all offer cards that do not charge foreign transaction fees. 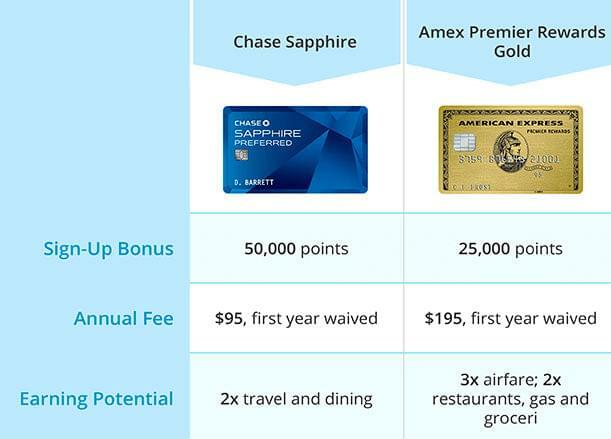 It’s hard to beat Chase Sapphire Preferred if you’re looking for a good general travel rewards card. Its standard sign-up bonus is a generous 50,000 Ultimate Rewards points, the annual fee is a reasonable $95 that’s waived for the first year, and it has a solid earning scheme with double points for travel and dining. It’s worth mentioning that travel is generously defined to include everything from airfare and hotels to taxis and gas. Chase Ultimate Rewards, which you have access to with this card, is also an excellent program. Though it has the fewest airline transfer partners of the three big credit card rewards programs, its seven partners were chosen wisely. They include two big U.S. carriers, United and Southwest; British Airways, which is excellent for short-haul redemptions; the luxurious Singapore Airlines; and solid international carriers from Europe (Air France KLM and Virgin Atlantic) and Asia (Korean Air). With those partners, you’ll get access to all three of the major airline alliances: Star, oneworld and SkyTeam. You’ll be able to transfer and redeem your points for travel to anywhere in the word. Sapphire’s runner-up is the also excellent American Express Premier Rewards Gold card. It may have a smaller sign-up bonus at 25,000 points and a higher annual fee at $195, but it also has several things going for it that the Sapphire does not. First and foremost, it’s part of the most flexible program out there, American Express Membership Rewards. As part of that program, you’ll be able to transfer your points to 17 different frequent flyer programs.In addition to getting access to British Airways, Singapore Airlines, Air France KLM and Virgin Atlantic, which also partner with Ultimate Rewards, you’ll be able to transfer points to five North American carriers: Delta, JetBlue, Virgin America, Air Canada and Aeromexico; luxury airlines Cathay Pacific, Etihad Airways and Emirates; European airlines Alitalia and Iberia; Japan’s ANA; Israel’s EL AL; and perennial frequent flyer favorite, Hawaiian Airlines. You can’t beat this program for flexibility when it comes to redeeming points.The card comes with more. You’ll earn an excellent triple points for all airfare and double points for gas, groceries and dining out. Sapphire doesn’t offer a bonus for groceries, something most of us buy regularly. Your other two options for personal cards that don’t incur foreign transaction fees aren’t stellar. Neither the Citi ThankYou Premier nor the Premier Rewards Gold card card comes with a sign-up bonus. While the ThankYou Premier card does have decent earning potential and a reasonable annual fee, the ThankYou Rewards program isn’t necessarily better than Chase’s Ultimate Rewards. It has more airline transfer partners, but a number of them are small international carriers that most of us are unlikely to ever use. In fact, the only domestic carrier in its lineup is Virgin America. There are two business cards with no foreign transaction fees and which allow you transfer your points directly to frequent flyer programs. You’ll have to be either a small business owner or an independent contractor to qualify. If you are, you have access to two excellent cards: Chase Ink Plus Business and Amex Business Gold Rewards. Both are great options, but I have to give the edge, once again, to Chase. 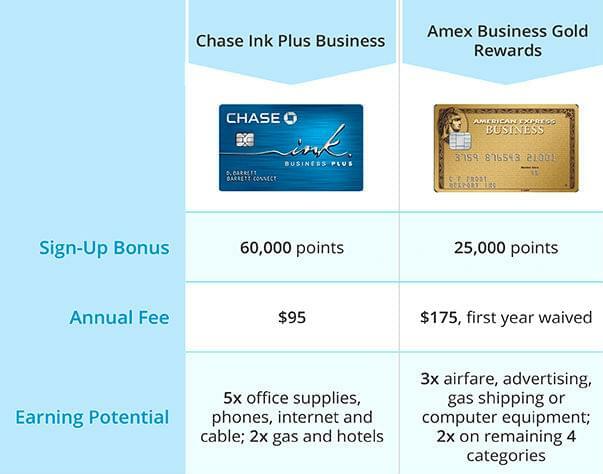 Ink Plus has a much bigger sign-up bonus at 60,000 points, compared to the Business Gold Rewards’ 25,000 points. It also has a smaller annual fee of $95, though it’s not waived for the first year like the Amex card. While an extra 35,000 points for a sign-up bonus is nothing to scoff at, the Chase card really shines because of its earning potential. It offers a remarkable quintuple points for several categories of purchases that include some recurring bills: cell phones, land lines, internet, cable and office supplies. You’ll also get double points for gas and hotels. The Business Gold Rewards card has decent earning potential, but nothing like Ink Plus. You get to choose one of five categories to earn triple points, and the remaining categories earn double. You can choose from airfare, advertising, gas shipping or computer equipment. Though it depends on your spending habits, these bonus earning categories probably won’t be as lucrative as Chase’s. 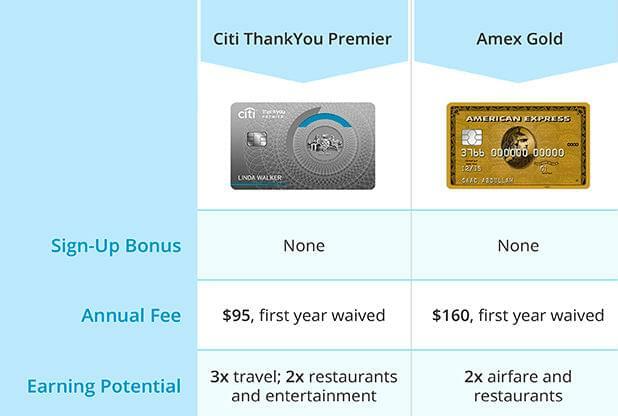 If you’re looking for a card with major perks that does not charge a foreign transaction fee, and you’re willing to pay big bucks for it, you have a couple of options: Citi ThankYou Prestige and Amex Platinum. The ThankYou Prestige card appears to be the easy winner. It has a slightly bigger sign-up bonus and much better earning potential. You’ll get triple points for airfare and hotels and double points for dining and entertainment. The Platinum card has no bonus earning categories. It’s hard to say which card has the better perks. They have very comparable benefits. The two standouts, getting a 33% to 60% bonus on airfare through the ThankYou travel portal and having gold status with Hilton and SPG, might push me towards one card or the other. 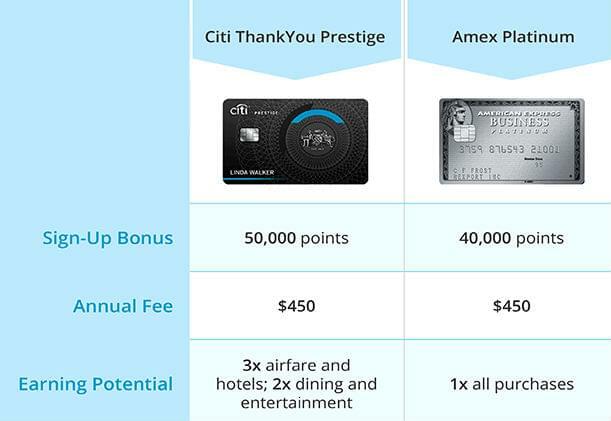 To complicate things more, Membership Rewards has more and better airline transfer partners than ThankYou, but the Prestige card has better earning potential, offering bonus miles for purchases in several different categories. If you qualify for a business card, I’d look long and hard at the Chase Ink Plus with its best-in-class sign-up bonus and fantastic quintuple earning potential. Chase Sapphire is also a great option with a sign-up bonus that is nearly as good and double points for all travel purchases, including commuting expenses and gas. The Amex Premier Rewards Gold and Business Gold Rewards cards are worthy contenders, too. But their annual fees are nearly twice as much, and their sign-up bonuses are about half as big. You’ll have to decide if access to the most flexible rewards program, Membership Rewards, makes up for those shortcomings.